In respect of airframe and armament the Snark was one of Sopwith's most remarkable creations, and only in fairly recent times has its full significance been recognised. Reversion to the triplane formula was interesting from several aspects, notably in that the Snark was designed to meet the same general requirements - those of the RAF Type I specification - as the similarly powered Snapper biplane, described in the following chapter. The generous wing area afforded by this formula - 322 sq ft (29.9 sq m) against the 292 sq ft (27.1 sq m) of the Snapper - was considered to be beneficial both to performance and handling at altitude (especially when two Vickers guns were the sole armament) or, alternatively, to the carrying of a greatly increased armament, though obviously, in this case, with some sacrifice in performance generally. The maximum speed was, in fact, at least 10 mph less than the Snapper's. The wing arrangement was far more complex than that of the famous rotary - engined Triplane single-seater of 1916 (the design of the Snark dated from early 1918, and Herbert Smith signed drawings on 20 April of that year), for not only were the interplane struts of 'normal' - that is, double - form, but stagger was sharply unequal (about 21 in on the upper bays and 12 in on the lower ones). As formerly, there were ailerons on all six main wing panels. Of even greater interest perhaps (though it had a precedent in the Snail C4288) was the monocoque fuselage, with the basic armament of two Vickers guns almost literally built-in to it, slightly below the centre line and almost at the level of the rudder bar. The rounded cross-section of the fuselage blended very happily with the installation of the A. B.C. Dragonfly radial engine, whether a spinner was fitted (as on the third machine) or not (as on the first). Three Snarks - F4068-F4070 - were ordered in April 1918, and by 26 June following the still-uncovered wings of F4068 had been attached to the fuselage (itself completed, as were the landing gear and tail). The Vickers guns had been installed (prudently, if not necessarily, as will later become apparent) during May. Nevertheless, it was decided in October that only this first example of the Snark should be finished and delivered - a decision which (as in the case of the Snapper also) was not, in the event, acted upon. By October the airframe of F4068 had already been cleared for flight (this clearance having in fact been given in September) though an acceptable engine was not delivered until December. Peacetime-pace and magneto trouble apparently shared the blame for the installation not being completed until April 1919. In July there was an engine-change, and trials did not take place (at Brooklands) until September. By the end of 1919, Snarks F4069 and F4070 had been completed, and on 12 November (the war having then been over for a year) F4068 had been delivered to Martlesham Heath, though it was soon returned to Sopwith for another engine-change before resuming its official trials at Martlesham in March 1920. Concerning the second Snark, F4069, little is known, though F4070 ultimately flew early in 1921. As tested at Martlesham Heath F4070 had a very large spinner (not open-fronted as on one of the Snappers, the Cobham I and the Rainbow), a modified engine cowling and very prominent air intakes for the carburetters, these intakes extending downwards from behind the engine almost half-way to the axle. The vertical tail-surfaces - similar in form to those of the early production-type Snipe - appear to have been identical with those of F4068; thus the side area of the new engine installation could have been of little consequence in this connection, and 'the hunting of the Snark' may not have become a serious phenomenon. As for armament, the present writer remarked some years ago: 'The Snark was the most heavily armed single-seat fighter of the 1914-18 war; but by the time the Gloster S.S.19 appeared in 1932 with a similar armament - two synchronised Vickers guns and four wing-mounted Lewis guns - its existence seems to have been entirely forgotten. That only one of the three specimens built appears to have been thus armed (the basic war load being the two Vickers guns) does not detract from the type's significance. The two Vickers guns were entirely 'buried' in the fuselage, and the Lewis guns were in two close-set pairs, one pair under each bottom wing, in which were provided a pair of staggered access panels. There were brackets for an Aldis sight forward of the windscreen, offset to starboard, and a ring-and-bead sight a little further to starboard, the pedestals being canted outwards by the curved monocoque fuselage.' (The monocoque construction, of course, probably accounted for the early fitting of the Vickers guns during construction of F4068, as previously mentioned). Yet even now, one fact of truly historic significance has yet to go on record: The Snark was the last RAF fighter, experimental or otherwise, to have a wooden monocoque (or something akin thereto) fuselage - until the arrival of the de Havilland Mosquito W4052, which made its first flight on 15 May, 1941. The only possible exception, one believes, might have been one of the B.A.T. machines but the point would be an academic one indeed. (Should the Avro Avenger of 1926 be advanced as a claimant, then one would submit that this was a private-venture type which was never to bear Service markings). A final footnote: The Snark's only known public appearance was on the occasion of a demonstration of the Wallaby, when it 'chucked stunts', seemed 'uncommonly fast', landed, and disgorged Harry Hawker, who was flying coatless, though 'everybody else was cold enough though well wrapped up." Span 26 ft 6 in (8.1 m); length 20 ft 6 in (6.2 m); height 10 ft 1 in (3 m): wing area 322 sq ft (29.9 sq m). Maximum weight 2,283 lb (1,035 kg). Maximum speed 130 mph (209 km/h) at 3,000 ft (914 m); range 300 miles (480 km). Snark. Designed in 1918 and flown in 1919, the Snark was the most heavily-armed single-seat fighter of the 1914-18 war; but by the time the Gloster S.S.19 appeared in 1932 with a similar armament - two synchronized Vickers guns and four wing-mounted Lewis guns - its existence seems to have been entirely forgotten. That only one of the three specimens built appears to have been thus armed (the basic war load being the two Vickers guns) does not detract from the type's significance. The two Vickers guns were entirely 'buried' in the fuselage, almost at the level of the rudder bar, and the Lewis guns were in two close-set pairs, one pair under each bottom wing, in which were provided a pair of staggered access panels. There were brackets for an Aldis sight forward of the windscreen, offset to starboard, and a ring-and-bead sight a little further to starboard, the pedestals being canted outwards by the curved monocoque fuselage. Despite the fact that, by 1918, the triplane configuration was widely considered as passe for the fighter, on 14 May of that year, Sopwith was awarded a contract for three prototypes of a new single-seat fighting triplane, conforming to the RAF Type I specification and named the Snark. Powered by a 320 hp A.B.C. 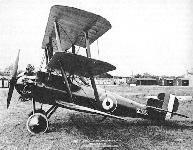 Dragonfly I nine-cylinder radial and featuring a plywood monocoque fuselage, the Snark was an equi-span staggered triplane and its designed armament was somewhat radical in the weight of fire that it offered, consisting of two synchronised 0.303-in (7,7-mm) guns on the fuselage and four weapons of similar calibre mounted two per side under the bottom wing. The first Snark was passed for flight test in September 1918, but unavailability of a Dragonfly engine and the decision to make various minor modifications delayed manufacturer’s trials until September of the following year, the aircraft arriving at Martlesham Heath for official trials on 12 November 1919. The second prototype reached Martlesham on 17 March 1920, and the third prototype, with a 360 hp Dragonfly Ia engine, late in the year. Apart from engine problems, the Snark triplanes suffered fuselage deterioration and all three were written off in 1921. Max speed, 130 mph (209 km/h) at 3,000 ft (915 m). Loaded weight, 2,283 lb (1036 kg). Span, 26 ft 6 in (8,08 m). Length, 20 ft 6 in (6,25 m). Height, 10 ft 10 in (3,30 m). Wing area, 322 sq ft (29,91 m2).